Seasonal Tire Totes are a tire carrying and storage system that takes the hassle out of changing from winter tires to summer tires. Their compact, clean styling makes them the perfect choice for the organized garage and for transporting race tires in the trunk or on the backseat of a car. A heavy-duty shell with an easy-to-carry handle slips over the tire to protect clothing and a vehicle's interior from tire and brake residue. In their totes, tires stay neatly covered and stacked until the next season rolls around again. Protects clothing from tire and break residue. Makes it easy to carry tires. Protect vehicle interior from tire and brake residue. Extends the life of the tire. 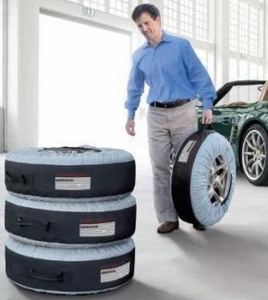 One size fits most passenger vehicles (22"-31" tires). The Tire Tote Wheel Felts are soft felt pad that protect tire rims from scratches and knicks that are associated with the transportation and storage of seasonal and event tires. The Wheel Felts simple slide into the Tire Tote products and clip in place for a secure snug fit. In addition to protecting your valuable rims from knicks and scratches the Wheel Felts create a fully enclosed tire bag, adding another level of protection for your cloths and vehicle interior while transporting your tires. Pad size 1/4" x 20"